We provide OT services that support and promote the achievement of a child’s independence, quality of life, well-being, and overall development. Services include individual direct therapy sessions, group classes, direct consultations, and evaluations. An observation and evaluation of the child’s background, developmental, and environment helps determine what is the best course of action. Evaluations include testing and direct observation. Observation can be conducted at the clinic, school, or home. Our toddler’s sensorimotor group class is designed to engage your child’s senses through a range of activities. Participants will explore a variety of sensory materials that will stimuli the different sensory systems, and will allow you to learn your child’s preferences, strengths, and curiosities. 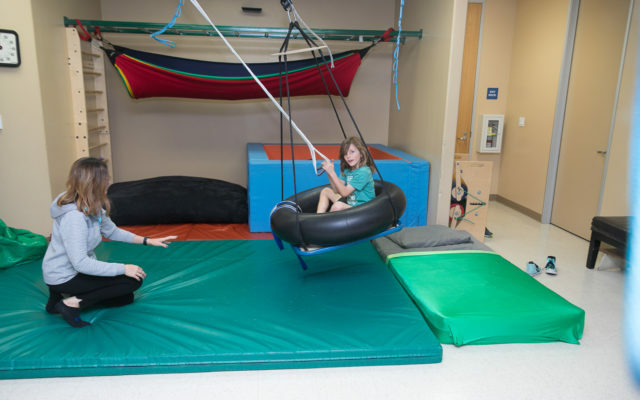 Uniquely designed for children with all abilities, the sensorimotor group classes are designed to develop and promote sensory processing and motor planning skills. Developing fine motor and sensory skills through art. Participants will strengthen their hand muscles while working with clay, and develop functional grasp patterns, motor control, and eye-hand coordination through the use of tools, painting, and drawing. Observing, volunteering, and shadowing is a great way to learn about pediatric occupational therapy, the tools, techniques, and the private clinic setting. We’re welcoming students to come and join us.